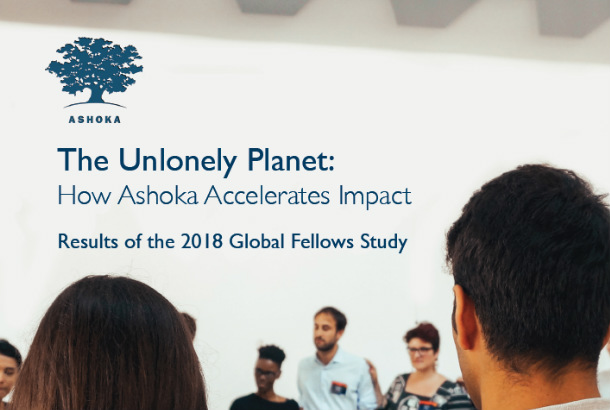 In 2018, Ashoka led one of the largest and most diverse studies of system changing social entrepreneurs ever conducted. And we found that Ashoka Fellows are having systems-level impact — 74 percent have achieved change in public policy or legislation, others are changing market systems, and mindsets. All are working towards an Everyone a Changemaker world by engaging countless others in their efforts to realize change for the good of all. We also found that Ashoka is clearly accelerating Fellows' ability to create their systems change impact. Overall, 84 percent of Fellows reported that Ashoka has helped increase their impact. Learn more about the study results and Fellows' systems changing strategies in the 2018 Impact Report. Learn more about the study results and Fellows' systems changing strategies in the 2018 Impact Report. Many thanks to all of you who have offered critical partnership, funding and time to be part of our journey to help people find their way to changemaking for good. Please donate to help Ashoka support our incredible network of Fellows and grow the Everyone a Changemaker movement. Donate Today!